One of the best features about all Macs is the excellent built-in help, and OS X Yosemite doesn’t cheat you on that legacy: This system has online help in abundance. When you have a question about how to do something, the Help Center is the first place you should visit. Clicking the Help menu reveals the Search field at the top of the menu and the Mac Help and New to Mac items. 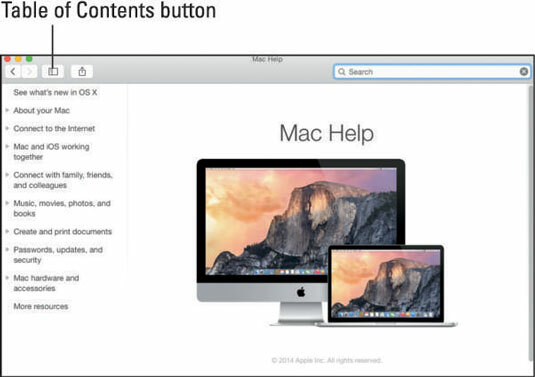 Choosing Mac Help opens the Mac Help window; choosing New to Mac launches Safari and displays a tour of OS X Yosemite. Though the keyboard shortcut for Help no longer appears on the Help menu, the same shortcut as always, Shift+Command+?, still opens Help. You can browse Help by clicking a topic in the Table of Contents and then clicking a subtopic. If you don’t see the Table of Contents, click the Table of Contents button. 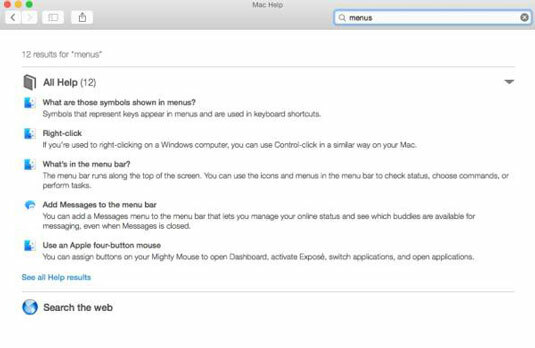 To search Mac Help, simply type a word or phrase in either Search field — the one in the Help menu itself or the one near the top of the Help window on the right side — and then press Return. In a few seconds, your Mac provides you one or more articles to read, which (theoretically) are related to your question. Usually. If you type menus and press Return, for example, you get 12 results. As long as your Mac is connected to the Internet, search results include articles from the Apple online support database. Although you don’t have to be connected to the Internet to use Mac Help, you do need an Internet connection to get the most out of it. That’s because OS X installs only certain help articles on your hard drive. If you ask a question that those articles don’t answer, Mac Help connects to the Apple website and downloads the answer (assuming that you have an active Internet connection). These answers appear when you click See All Help Results near the bottom of the figure. Click one of these entries, and Help Viewer retrieves the text over the Internet. Although this can sometimes be inconvenient, it’s also quite smart. This way, Apple can update the Help system at any time without requiring any action from you. Furthermore, after you ask a question and Mac Help has grabbed the answer from the Apple website, the answer remains on your hard drive forever. If you ask for it again — even at a later date — your computer won’t have to download it from the Apple website again. Click Search the Web (near the bottom of the figure) to launch Safari and perform a web search for the phrase you typed. Type a word or phrase in the Help menu’s Search field. Select any item that has a menu icon to its left (such as the three items with “Trash” in their names). The automatic visual cue — an arrow — appears, pointing at that command in the appropriate menu. Finally, don’t forget that most apps have their own Help systems, so if you want general help with your Mac, you need to first click the Finder icon in the Dock to activate the Finder, and then choose Mac Help from the Finder’s Help menu.